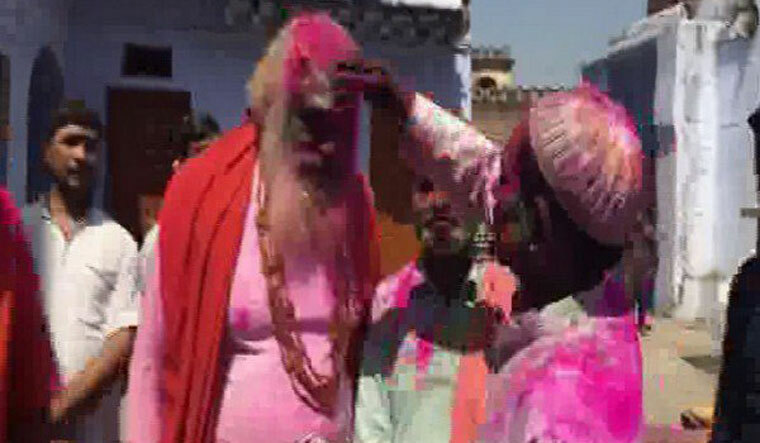 Pushing for a moderate outcome in the Ayodhya case, Iqbal Ansari and Mahant Dharamdas—two of the litigants in the title dispute—celebrated Holi together in Uttar Pradesh. "We have blended with our brothers just like two colours mix together, effortlessly,” he added. Mahant Dharamdas said that humanity was their priority and they cannot be divided based on votes. He added that their Muslim brothers were with him, and they wanted a temple on the spot. The Supreme Court, on March 8, had announced the Ram Janmabhoomi-Babri Masjid dispute in Ayodhya would be referred for mediation for its amicable resolution. The Supreme Court announced a three-member committee would mediate. The mediators are former Supreme Court justice F.M. Kalifulla, spiritual leader Sri Sri Ravi Shankar and legal mediator Sriram Panchu. Kalifulla would be the chairman of the committee. The mediation committee's proceedings would be conducted in Faizabad and would be in-camera, without media presence. The mediation process will conclude in eight weeks, with the three-member committee being asked to submit a 'status' report in four weeks. Interestingly, while Muslim bodies supported the Supreme Court's suggestion of referring the Ayodhya dispute for mediation, only the Nirmohi Akhara, among the Hindu bodies, supported it. The Hindu Mahasabha was split on the issue of supporting mediation.